OUR PRICE: $19.98 - Join Rewards Get $1 Dance Dollars On This Item! 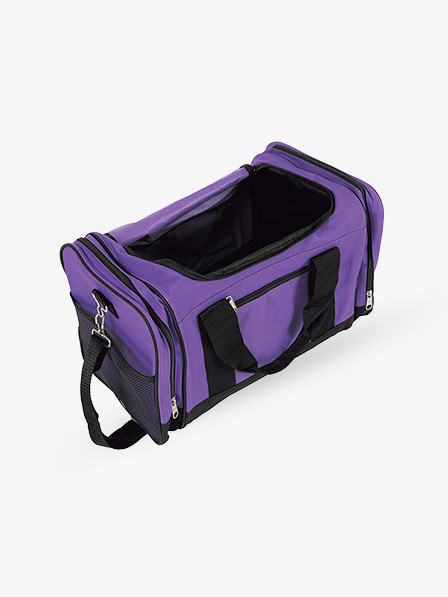 The perfect bag for storing and transporting all of your dance accessories, from shoes to leotards! Medium-sized duffle bag features a spacious zippered main compartment, two zippered side compartments, two side mesh compartments for easy water bottle access, front zippered pocket for cellphones and other personal items, and a removable padded cross body strap. We got one of these bags for my daughter, and now we are getting 3 more for other family members, because we love it so much! The size is really nice - roomy but not overly large, like many duffles. The wide opening allows great visibility and access. The zippered end pockets are roomy enough for a water bottle or many other uses. I like that, in most cases, the shoes will fit crosswise in the bag, allowing 3-4 pairs of shoes to be set side by side along the bottom of the bag. We also purchased mesh bags to help with shoe and gear organization. Beautiful, vibrant colors! So happy with this bag, and the price is great for what you get!